You might have read about Search Engine Friendly URLs which are considered a backbone of SEO. A website’s URL Structure should be Clean and SEO Friendly and must not include Special Characters, because URLs with Special Characters are difficult to be remembered by a user. In this post I will discuss about some methods by which you can make a User Friendly & Search Engine Friendly URLs in your website. 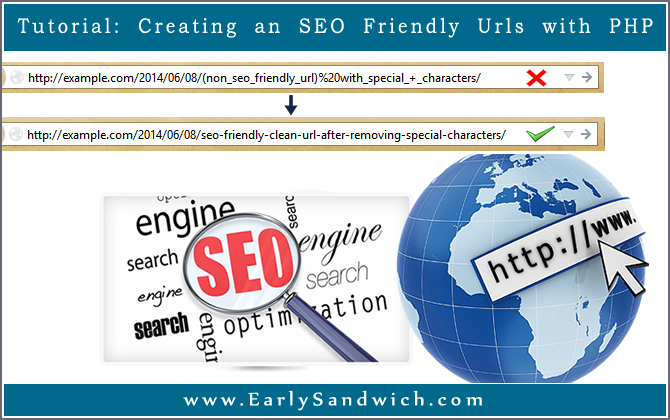 The first and most important thing to keep in mind is, don’t create Urls with Special Characters like & ! @ # $ % ^ & * ( ). Search Engines will not encourage URLs having this kind of structure. Instead you should use URLs which contains only Alphabets and Numbers. Secondly, you should use dashes as separators instead of spaces or underscores, as spaces are converted to %20 sign when indexed by Search Engines. Underscores are also not considered a best option as a separator because a text with underscores is considered a regular expression and they do not separate the words instead they make it one complete word. Feel free to download this script from here and use it anywhere in your code/projects.